In addition to ongoing classes and programs at his academy, Shidoshi Miller also conducts a wide range of seminars and events for beginners through advanced students. He offers programs that are highly focused in the areas of general martial arts, authentic Japanese Ninjutsu, reality-based self-defense, workplace violence survival, defensive combat handgun, and personal empowerment, to name just a few. 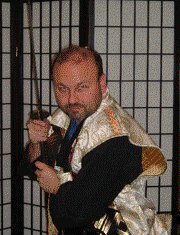 Have you dreamed of being a Black Belt, a Master of the ancient lessons and techniques of warriors, or do you recognize the dire need for self-defense training in Today's often dangerous world, and feel the need to get this part of your life under control? "In these powerful, confidence-building programs, Shidoshi Miller teaches you how to gain the type of control over those negative forces in the world that often conspire to derail you from success and the achievement of your goals." Seminars, workshops and intensives make excellent platforms for learning basics, advanced applications, and specialty topics. They're perfect as add-on training for in-house students working through a standardized curriculum as-well-as for the distance student with time and travel constraints. In each one, you'll embark on a journey that combines time-tested and proven techniques for success with the Shidoshi's real-world experience. Now You Can Get The Shidoshi's Seminars on DVD! Mastery, whether personal or in handling danger, is not acquired in one book, one experience or one event—it's earned through concentrated energy and focus. The Mastery Program is not a "Black Belt" program, nor will it make you a Ninja Warrior over night...make you a fantasy super-hero...or be instantly invulnerable to attacks. It's far more powerful and achievable than that. The Mastery Program bridges the most powerful concepts from the nuts-and-bolts world of the successful warrior and the spiritual world of enduring happiness. Achieving outrageous results takes work! If it happened over night, everyone would do it. But it's not as hard as you think, and the process is incredibly fun and satisfying. Regardless of your current understanding, education, or skill, if you're willing to roll up your sleeves and get to work, it will put you into high gear like nothing you've ever experienced. Simply put...it will change your life. Regardless of whether you're an active local student at the WCI Academy or looking to add unbelievable power to your growing arsenal of skills - whether you're a beginner or advanced student, or somewhere in-between, these intensive programs will help you develop the confidence, power, and control of a modern-day warrior! Click here to learn more about the Journey of Power! What Are the 2 Keys for effectively defending yourself? Want to know? Get an ongoing stream of powerful, life-saving and empowering information about upcoming training opportunities, as-well-as articles on self-defense, martial arts, ninjutsu, etc. Subscribe to the Warrior Concepts online newsletter, right now!